Handsome green hedges and Topiary. 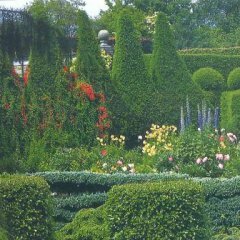 A painstakingly clipped hedge or piece of topiary was once the hallmark of a grand formal garden. Cottage gardeners adapted the tradition to suit their more spontaneous style, and today we can borrow from the past to use shrubs of all kinds to create boundaries, backdrops and focal points of distinction. Buy bare-rooted plants: Specimen shrubs are almost always sold in containers. This means they can be planted all year round � except during freezing, waterlogged or very dry, hot weather � with immediate results. If you are planning to grow hedges, however, it is much more cost-effective to buy younger plants with bare roots. These will need planting in the winter when they are dormant and your hedge may take a couple of years to thicken out, but it will establish quickly and work out much cheaper. Use a mechanical digger: If you have a long length of hedge to plant, you can save yourself some hard work by hiring a small mechanical digger to break up the ground. Plan to do your digging about a month before planting the hedge, add quality tree and shrub compost to the soil and then let it rest. The soil will settle down gradually during this period. When you are ready to plant the hedge, the earth should still be easy to work and you will only need to dig holes large enough for the rootball of each plant. Mulching is essential: Applying mulch to the base of a young hedge is essential to prevent the growth of weeds. Remove any perennial weeds and their roots, and then spread a generous ten centimetre layer of cocoa shell, chipped bark or well�rotted garden compost along the base of the hedge. Make a path in front of your hedge: Hedges need regular maintenance, so leave a path between a hedge and a flower bed. Make sure there is enough room to move about, possibly with a Wheelbarrow, or even to erect scaffolding if the top of the hedge is too tall to reach from ground level. 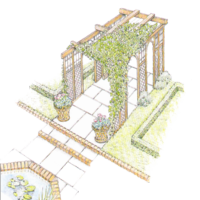 Save precious space: Although hedges offer many benefits, they are greedy for space so, in a small garden, they may not be the best solution. 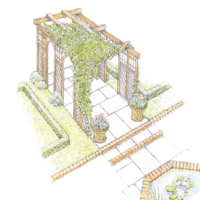 If you really want a living screen around the garden, consider erecting a trellis and growing climbers or, for a fruitful option, espalier and fan trained fruit trees. Fast growers: There are some shrubs, in particular conifers, which will grow into a hedge fairly quickly. The disadvantage is that the vigour of these shrubs does not diminish once the hedge is established, which means you will have to cut them three or four times a year to keep them in check. The most rampant growers are the Leyland cypress (Cupressocyparis leylandii) and false cypress (Chamaecyparis). 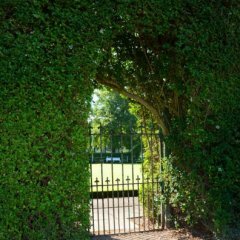 Good hedges make good neighbours: Until recently, property owners have been able to grow very tall hedges, regardless of their neighbours’ wishes. The law is now changing to require owners to trim their hedges to a certain height. You are still within your rights to cut back any branches or roots that intrude into your own property. A 'Wild' hedge: A natural or mixed hedge is composed of several different hedge plants and is not neatly clipped. It may not be as dense as a uniform evergreen hedge, but it looks attractive and needs less attention. You may need to curb the vigour of some plants to leave room for more timid ones. blackberry (Rubus fruticosus), dog rose (Rosa canina) and holly. If space permits, do what farmers do and take advantage of any strongly growing trees that the hedge throws up. Let them grow to their full height as this will add interest.